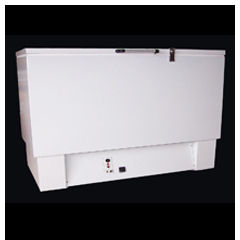 The industrial freezer model 40-9.4 is a ruggedly built industrial chest freezer which can operate from 0°C to -40°C. It is designed for use in industrial settings where strength and durability are required. Can be used for production or R&D. Common industrial applications include epoxy storage, shrink fitting and cold temperature testing. It features an all-steel construction, inside and out with key-lockable lid, digital temperature controller, audio/visual alarm system, casters for easy mobility and cfc-free refrigerants. All industrial freezers are backed by an 18 month parts and labor warranty! This industrial freezer can be equipped with a host of accessories like chart recorders, access ports, backup systems and many more. For use in industrial or laboratory applications where performance and quality count.